One of the all-time proven battlefield rounds, the 7.62x39 is a fantastic round to have around for hunting, target shooting, plinking or even for personal defense. The caliber and the associated firearm platforms can do it all. 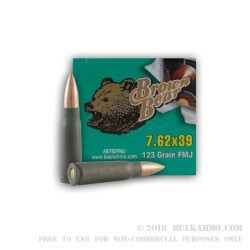 The Brown Bear load has been a very good performer over the years, and mimics very closely, the Eastern Bloc military surplus ammunition we are all used to shooting, or at least all those who were early adopters to the SKS, AK and other 7.62x39 firearms. This is a better round than the older mil spec rounds and offers a substantially similar price point to those older, cheap rounds. These feature a non-corrosive build and have a better coating (more uniform) on the steel casing. They are still not easily reloadable, due to the hard to re-prime Berdan primer pocket and the steel casing which is harder to reform. The steel casing offers a better pricing in volume, and the price point allows for you to justify tossing the spent cartridges. The non-corrosive powder and primer means you don’t have to worry as much as you once did about rust in your bore or on the key internals of your rifle. 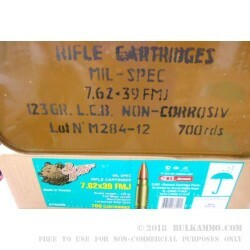 This ammunition is special, due to its inherent reliability from a feeding, firing and extraction/ejection perspective.